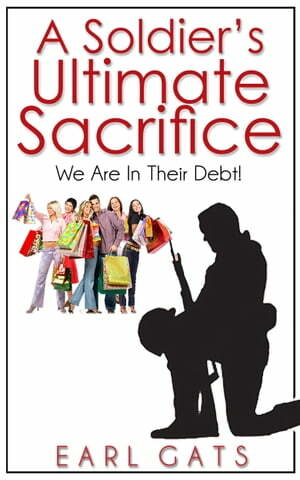 Collins Booksellers - A Soldiers' Ultimate Sacrifice by Earl Gats, 9781310154485. Buy this book online. In America, we live in a world of opulence, opportunity, freedom and liberty. Yet, many of us don’t realize how good we have it because we’ve never had a Tomahawk Missile fly over our heads or an Abrams Tank roll over our front yard during breakfast. A Soldier&apos;s Ultimate Sacrifice simply demonstrates many of the sacrifices that soldiers have made, allowing many of us to enjoy a comfortable living and plenty of opportunities for citizens to succeed in this country. “Soldiers have sacrificed their lives and limbs for the right of consumers to purchase and retailers to sell their goods and services we take for granted every day.” If you have ever walked into a shopping mall or any retail establishment over the past 10 years to purchase any product you wanted or desired, you should read about a few of these sacrifices.